It seems as though everyone is looking to save money these days. There are a lot of expenses associated with owning a car and one of the big ones is auto repairs, outside of gasoline, car insurance, and any car payments you might still be making each month. However, you can save a lot of money on regular maintenance and repairs if you follow these tips and shop for supplies at your local LaCava Auto Supply in Fall River. The more preventive maintenance that you can do to ensure that your car keeps running effectively and efficiently, the less likely you will be to wind up with unexpected major repairs. Taking time to learn about the various systems in your car can really help you to overcome common issues before they become big problems. It is also helpful to know that some of the ideas that people have about the frequency of maintenance services could be wrong, depending on the make, model and year of your vehicle. In fact, one of the most common misconceptions is regarding regular oil changes. 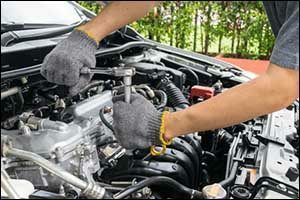 Many people believe that the hard and fast rule for oil changes is every 3,000 miles. If you go to the local quick oil change shop, they will usually put a sticker in your window that says you need to come back by a certain date or 3,000 miles, whichever comes first. But if you look at your owner’s manual, you might be surprised to discover that you can go much longer between oil changes, especially if you have good driving habits and live in a mild climate. BONUS TIP – Many new cars can go 5,000 or even 7,500 miles between oil changes and there are some brands of oil available at your local Fall River, MA car parts store that will allow you to go even longer! Ask about new oil products and supplies to do your own at-home oil changes for even bigger savings at LaCava Auto Parts. Another great way to save money on Fall River auto parts and services is to purchase your car parts and accessories from local shops instead of the big chains. This holds true with services as well, including getting your brakes checked, rotors turned or hydraulic hoses replaced. 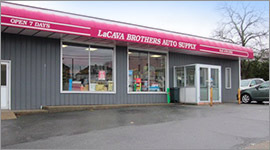 LaCava Brothers Auto Supply in Fall River offers a few in-house services and can also provide you with all the tools and supplies you need to take care of many other common repairs yourself. Feel free to check our local prices versus the big chains. You might be surprised to see a big difference in the cost of our LaCava auto parts compared to the big box stores. You don’t need to be a certified mechanic to gain knowledge about your car. The more you know before you take your vehicle in for repairs, the less likely you will be to “get taken” by less than honest repairmen. You don’t want to pay hundreds of dollars to replace a chain on your vehicle only to discover later that your model doesn’t have a chain, but a belt instead. That makes you wonder if anything actually got replaced or not! Lots of car owners have been there, but by the time they figure it out, it’s too late. You don’t need to be an expert, but at least have a basic understanding of the ins and outs of your vehicle so you won’t get caught off guard at the mechanic’s shop. Even if you decide not to do DIY preventive maintenance and repairs, you can still save money by coming to LaCava Auto Supply in Fall River to get the parts you need for the repairs. Some oil change shops will let you bring in your own filter and oil. If you find a shop that will do that, stop by and take a look at our wide range of Fall River, MA car parts. Even if you aren’t sure what part number or type you need, the LaCava auto parts team can help you get it right. Whether you are in the market to purchase auto parts and services or if you just want to browse and see all of the supplies and accessories available at LaCava Auto Supply in Fall River, you can stop by our shop anytime. We provide supplies and services direct to the public and to mechanics, professional contractors, and businesses in the Southeastern Massachusetts area. For over 70 years, LaCava Brothers Auto Supply has been a reliable and trusted source for services and auto supply in Fall River. Give us a call at 508-676-1951 or drop by our shop on Bedford Street anytime during office hours.